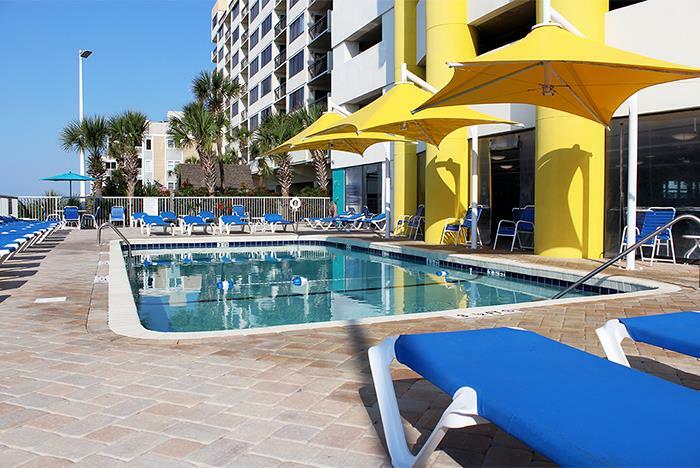 Situated just 0.6 miles from Azalea Sands Golf Club, 2.4 miles from Barefoot Landing and 1.2 miles from Grand Strand Airport, the contemporary Seaside Resort offers one-, two- and three-bedroom condos with full kitchens, cable TV, and free Wi-Fi. 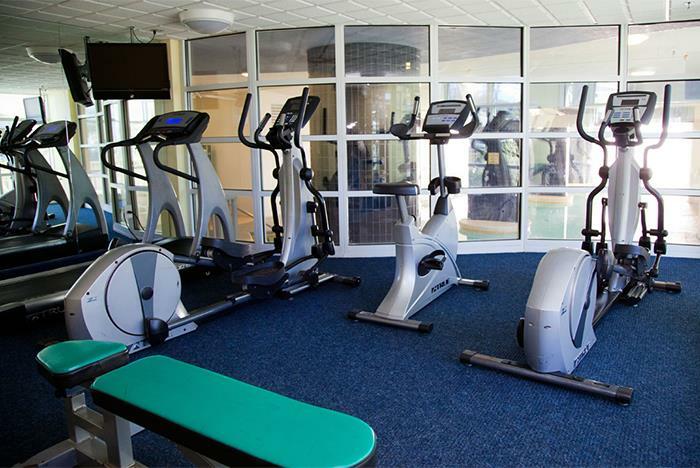 The resort also features modern amenities, including both an indoor pool and an outdoor pool, a lazy river, an exercise room, and more. 0.6 miles from Azalea Sands Golf Club. 2.4 miles from Barefoot Landing. 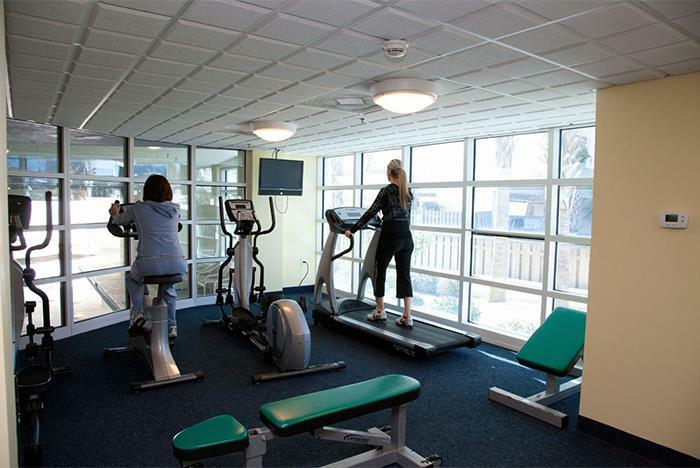 17.1 miles from Myrtle Beach International Airport. 24-hr front desk and security. 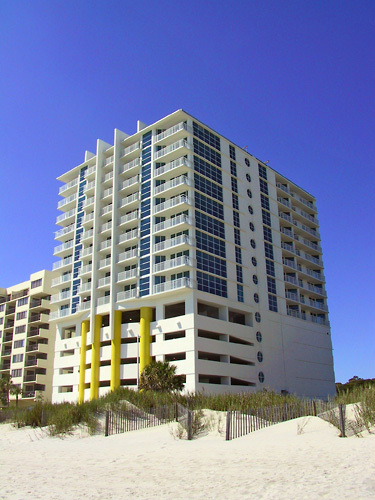 Welcome to Seaside in North Myrtle Beach, a place where you can enjoy oceanfront living at reasonable rates, with endless options for activities and amenities . Seaside offers you a coastal experience with gracious Southern hospitality, spacious and well-designed condominium accommodations , and a vivacious list of things to do here along our broad expanse of beach. The fun and excitement to be had in the north part of the Grand Strand is limitless. Here, you'll find not only the comforts and conveniences of home, but also carefree living at its finest, while you soak in the best that sun-filled South Carolina has to offer. What are the business hours at Seaside Resort? The unit will be ready for you at 4 PM when you check in. 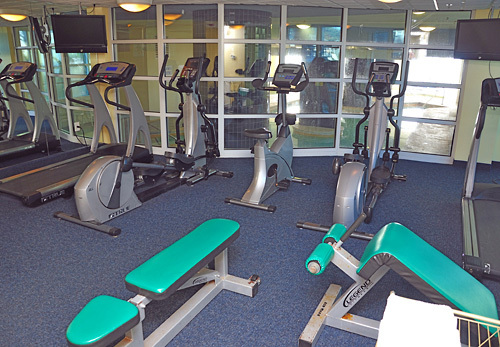 If you expect to arrive earlier, ask the front desk if the unit can be available before 4 PM. 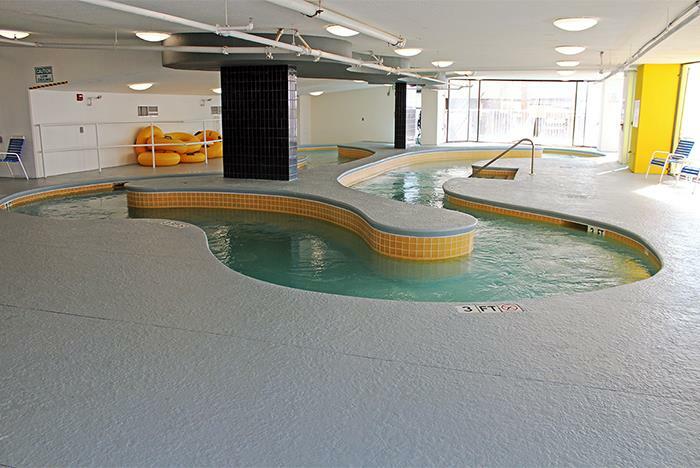 If not, please feel free to use the amenities at SeaSide until your 4 PM check-in (options include but are not limited to enjoying the pool and pool amenities, the beach and much more). What is the difference between oceanfront and ocean-view? Oceanfront means that your view out to the ocean looks directly onto the water without turning your head. You see the water directly in front of you. Ocean view means that your view to the ocean looks north or south up the coastline. You see the coastline, the beach, and the ocean in your view. Some views are from the side or at an angle, and you must turn your head. Others are directly ahead. Stove, microwave, oven, dishwasher, refrigerator with freezer. Pots, pans, mixing bowls, serving bowls, cooking utensils, eating utensils, drinking cups, plates, coffee cups, saucers. Paper products are not provided. All units have clothes washers and dryers. Are linens and towels provided at Seaside Resort? Does Seaside have laundry facilities? Yes. Units have washers and dryers or washer/dryer combo unit. There is no need to bring an ironing board and iron with you to the beach because either the unit is equipped with ironing equipment or you may request the equipment when you make the reservation, check-in, or during your stay. Is there wifi available for me to use with my laptop computer? What is the height of Seaside Resort's parking garage? The garage clearance height is 6 feet 1 inches, with the open overflow lot located beside the parking garage for oversized vehicles. How close is Seaside Resort to things to do? Centrally located in North Myrtle Beach within 30 minutes of most local attractions, shopping and within walking distance there are 10 restaurants. We are just a couple of blocks from Main Street, North Myrtle Beach, which boasts numerous restaurants, bars and attractions. Breakfast room is located on the 6th floor. Adults: $4.50, Children: $2.50. Includes cereals, milk, yogurt, eggs, sausage, biscuits, fruit cups, waffles, danish, bagels, coffee and more. Room can be booked with or without breakfast included. Are pets accepted at Seaside Resort? Pets are not permitted here. Service dogs are permitted, provided they are with their assigned owners who have on hand the appropriate documentation, immunizations and equipment that accompanies the animals. Owners must have their animals "in uniform" at arrival for check-in. Each guest with a service animal has the legal right to privacy in not disclosing the reasons for needing a service dog but must be able to produce the animal's service-related documentation if asked. 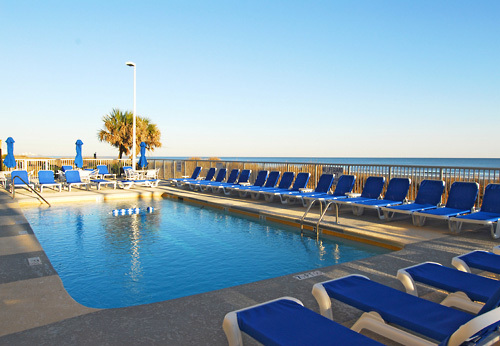 Does Seaside Resort provide pool towels or beach towels? Does Seaside Resort have beach umbrellas? The resort does not provide beach umbrellas or chairs but are available for rent from the lifeguards during season, (after Memorial Day and before Labor Day). Does Seaside Resort provide beach chairs? The resort provides poolside chairs but does not provide beach chairs. All resort pool furniture must remain at the pool area and may not be taken to the beach. Does the property allow smoking on the premises? No smoking allowed in the unit or on the balcony. If there are signs of smoking, a $150 fine will be charged. Ground floor garage to 4th floor garage has designated areas for smoking. What time does the ocean close, and what are other limitations for use of the beach? The beaches are public and remain open at all hours, any day of the week, for your enjoyment within the limits of the laws of the community. Swimming far beyond the shoreline or over shoulder-depth is limited to approval by the on-duty lifeguard. Other restrictions include limitations on swimming near piers, prohibiting sleeping on the beach between 9 PM and sunrise, certain styles of bathing attire, using glass containers/bottles on the beach, and possessing/consuming alcohol on the beach. If questions, please consult the City of Myrtle Beach. How far is Seaside Resort from the airport? 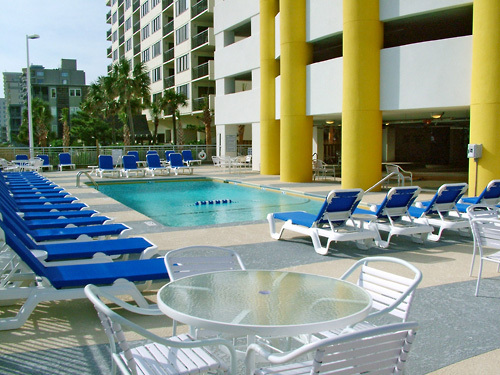 Seaside is approximately 20 miles north of the Myrtle Beach International Airport. 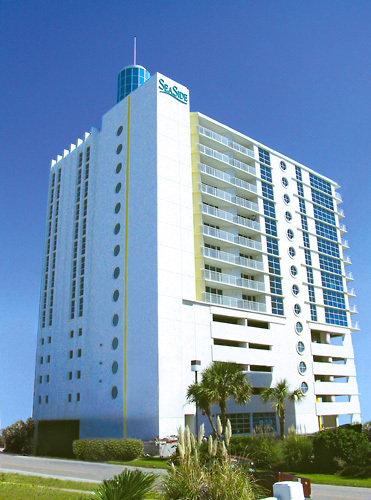 While SeaSide does not offer its own shuttle service, the front desk agents can tell you about modes of transportation including Lymo (transportation service around the City of North Myrtle Beach), rental of a vehicle or motorbike, even rental of a golf cart (check local jurisdictional restrictions). Are your pools heated and when do we start heating them? 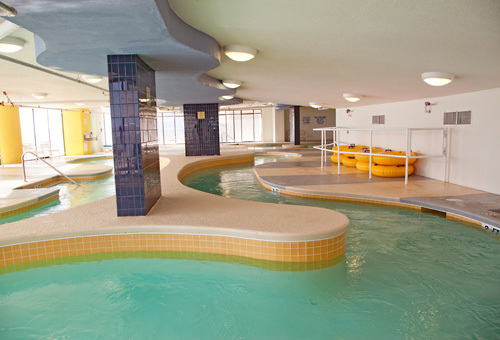 Our indoor pool and lazy river is heated year round. 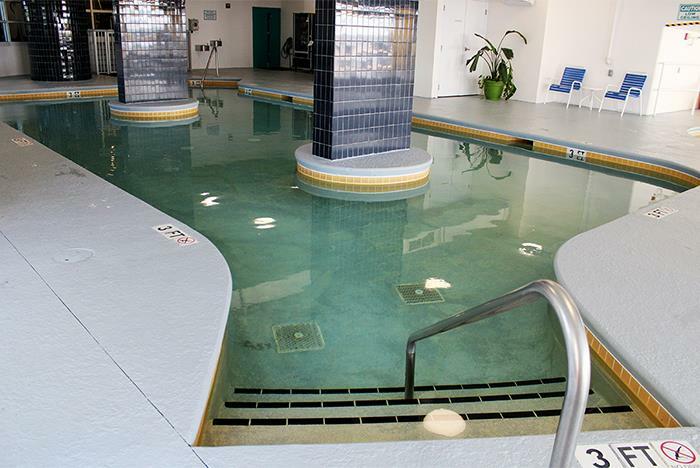 The outdoor pools are heated from end of Februay until season begins, and mid-fall until November. We don't heat outdoor pools November through February. For details, consult the front desk agent at SeaSide. No cooking, grilling, or barbequing is allowed on the balconies at SeaSide at any time. Anyone found violating this safety ruling may be fined by the City of North Myrtle Beach as well as the resort. How can I secure my valuables in my unit while I am a guest at SeaSide? You may request a condominium unit with a safe, subject to availability. Otherwise, for securing valuables, ask your front desk agent we have safety security boxes available at the FD for refundable fee $50.00 (in case the key isn't returned). Please note that we are not responsible for lost or stolen items while staying at the resort or parking garage. Please make sure that upon vacating your condominium unit you have thoroughly checked for any misplaced items. What is the age requirement for Seaside Resort?